“Noisy.” That is the meaning of the word pā’ia in the Hawaiian language. The vibrant – and sometimes still a bit noisy – northshore village of today had its beginning as a tiny Polynesian kahalewai (village by the sea) sitting on Maui’s windward coast along a freshwater stream. The shoreline was protected by an off-shore reef that, when the waves were from the right direction and size, created a nearly deafening roar from the sea and its residents and passing travelers thought that it was “pā’ia”: Literally, noisy. Today the noise is from the hustle and bustle of a many-faceted town that serves as the business center for a very diverse community. Pā’ia is also the seaside anchor of Maui’s Upcountry region spread across the north face of Haleakala. Pā’ia today is a town of many faces and holds a rich place in Maui’s history ranging from Hawaiian village to windsurfing. 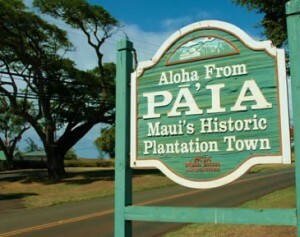 Pā’ia holds a rich place in Maui’s history. It has been through many different configurations, including a native village, a sugar mill and sugar and pineapple plantations town, hippie haven, surfing Mecca, windsurfing capital of the world, and now, an emerging tourist destination and way-station on the popular Road to Hana. All Temptation Tours’ Hana-bound excursions go through Pā’ia, giving the visitors a taste of the lively village. Pā’ia, today, is a reflection of its history as a booming sugar cane plantation town with many of its old plantation-era wooden buildings still intact. This quaint little beach town has an array of locally- owned specialty shops, boutiques, surf shops, antique stores, bakeries, art galleries, and even an old-fashioned tattoo parlor or two. Award winning restaurants offer casual and full-service dining with local and international culinary delights. 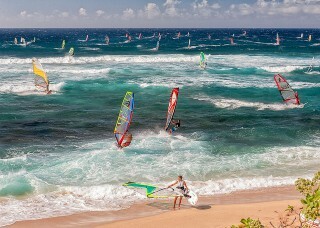 Pā’ia’s reputation for great winter season waves has drawn a devoted group of surfers, windsurfers, and now, kite surfers to the bustling community. The birth of the town phase can be traced to the opening of the original Pā’ia Store in 1896. The real roots, however, go further back to the creation of the plantation camps that housed workers of several small sugar cane plantations and the development of the Pā’ia Sugar Mill, which up until 2000, was Maui’s oldest operating plantation and mill. The mill opened in 1880 and the store was eventually built to support the needs of the immigrant sugar workers who labored on several plantations that sprang up in the area. In the last dozen years it has received another energizing infusion with the ever-increasing number of tourists who are discovering the town’s unique brand of modern, eclectic chic. They no longer just drive through the picturesque and historic area on their way to Hana, but are now stopping to taste the many flavors of the diverse island community. Today Pā’ia is a thriving, busy business center that serves the needs of tourists as well as a large and diverse community, while maintaining, indeed preserving, its sense of place, history, diversity, and unique feel. In the minds of many Maui residents, Kula is the island’s unexpected jewel. They happily leave the island’s fringe of sun-drenched sand to visitors and newcomers and make their homes and raise their families in the slow-paced rural communities that dot the north slope of Haleakala. 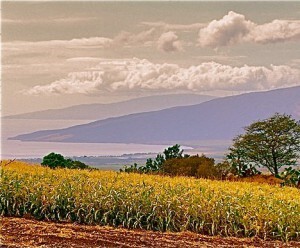 Kula is the heart of Maui’s “Upcountry,” a rambling region of the island where once farmers, cowboys, planters, and other country folks were the primary residents. The ill-defined boundary of Kula is largely drawn only in the minds of the residents, with no one having a distinct line to point to. 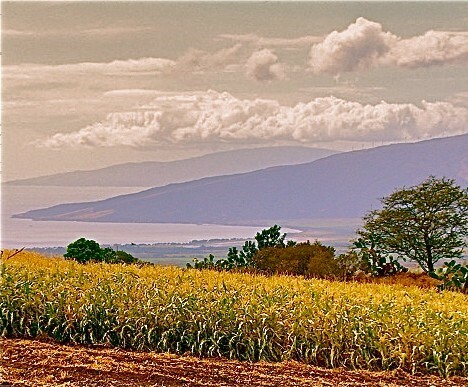 Kula’s fertile fields and temperate climate create a picturesque setting for the island’s farmers in Upcountry Maui. When the Territorial Legislature first set up the political design for the state in 1906, they decreed only two levels of government: state and county. None of Hawai’i’s cities or villages actually have boundaries or “city limits.” That’s why Kula is more a state of mind than a place: More a lifestyle than a single location on Maui’s map; a nebulous place anywhere along a fifteen-mile swath of land encompassing a region between about a thousand feet and four thousand feet of elevation along the western flank of Haleakala, our long-dormant volcano that dominates the island’s landscape and the Kula district. Communities along the old Lower Kula Road with names like Pulehu, Waiakoa, Oma’opio, and Keokea attest to Kula’s Hawaiian heritage, but each also has its own history of ethnic settlements by Maui’s first waves of newcomers: immigrant plantation workers. In the late 1800s, Portuguese and Chinese immigrants, who had fulfilled their labor contracts with the sugar cane plantations, moved to this area, drawn by the rural agricultural lifestyle. 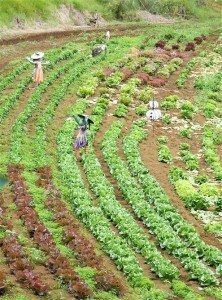 Later large numbers of Japanese farmers moved into the fertile area. 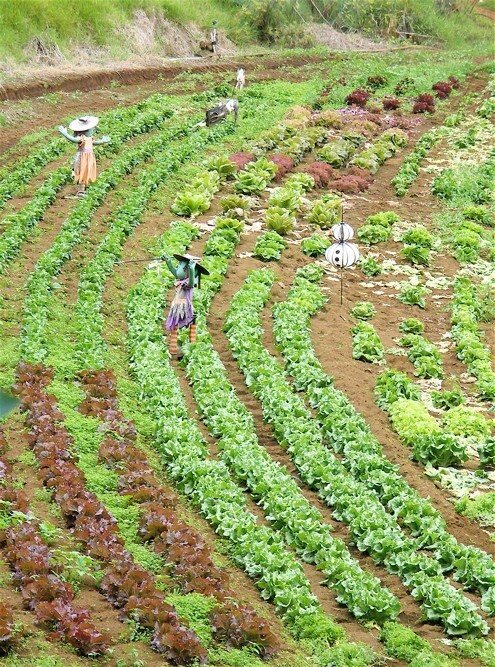 These farmers have been producing fruits and vegetables ever since. Maui’s famous Kula greens are grown on the cooler hillsides of Haleakala and protected by typically Maui scarecrows. Much of the produce is sold to local restaurants and at farmers’ markets. That farming tradition and lifestyle continue today, among the fancy gentlemen’s farms that have sprung up in the past 2 decades. Kula continues to grow its well-known sweet onions and corn, lettuce, tomatoes, carrots, cauliflower and cabbage. It is also a major source of cut flowers: Most of Hawaii’s proteas, as well as nearly all the carnations used in leis, come from Kula. Kula is generally thought of as the region encompassing the areas mauka (above) and makai (below) Lower Kula Road, the remnants of the old county road that once spanned the region before the present Kula Highway was finished in 1964. The old meandering road crisscrosses the straight-as-an-arrow modern highway in numerous places along its length from Pukalani to Keokea and gives frequent access to varied segments of the elongated community. All Temptation Tours’ excursions that include the journey to Haleakala Volcano – Summit Lavender Sojourn, Haleakala Sunrise, Crater and Rainforest – travel through the dramatic Kula region of Maui, indeed the jewel of rural “Upcountry” Maui. On Maui we have noticed a change in the weather. Rain has crept into the weather forecasts for the dry, leeward side of the island. The days are a tad cooler with the sun less intense, the breezy trades are more consistent and the nights are a little chilly and have people all over the island reaching for an extra blanket and a sweater. It is December and we’ve entered Ho’oilo, the cooler, wetter season of the old Hawaiian calendar that lasts for half the year. It’s our fall, winter, and spring combined. In June, Ho’oilo will yield to Kau, the hotter, dryer season in the islands for the other six months of the year. The subtle onset of Ho’oilo is here and the fireplace at Kula Lodge is a warming place for many. While not “months” as we think of them with their clearly assigned starts and finishes, the Hawaiian culture, like most ancient agrarian societies, related events, and seasons to the cycle of the Mahina or moon. They had no need to be specific about dates as we know them, and their environment provided all the signs they needed to divide the year into recognizable and meaningful periods. The ancient Hawaiians, along with their ancestors and relatives from throughout the Pacific Islands, were acutely aware of subtle changes in their natural environment. They knew when the winds shifted and when the ocean currents changed. They knew when the various celestial bodies in the heavens appeared and disappeared or changed positions and when the life cycles of the fish, birds and animals that provided their sustenance changed from one stage to another. Even in the tropics some trees and bushes turn and create the sense on autumn. Observation of their environment was the basis of their survival, and they planned and lived their lives around the knowledge gained and passed on from generation to generation by the kupuna (revered elders) in their mo’o’olelo and oli (chanted stories). So, the next time someone says we don’t have seasons in Hawaii, you can tell them about Ho’oilo and Kau – our two seasons that are as discernible to the keen observer as seasonal changes on the Mainland.